The journey began with a gut reaction. 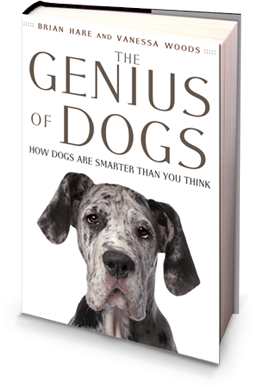 When The Genius of Dogs author Dr. Brian Hare watched chimpanzees fail to read a simple human hand gesture in a cognition test, he blurted out, "My dog can do that!" The psychology professor running the test challenged him to prove it, sending Dr. Hare on a 15-year odyssey to unlock the cognitive and evolutionary mysteries of our four-legged friends. The Genius of Dogs is a fantastic book. It makes it very clear that there are different kinds of intelligence. His research opened up startling discoveries on the intelligence of dogs. And now Dr. Hare and his team have used this research to develop the first-ever canine cognition assessment tool — the Dognition Experience — for anyone to use to discover the intelligence of their own dog, in their own home. Dr. Hare is the director of the Duke Canine Cognition Center, associate professor in evolutionary anthropology at the Center for Canine Cognitive Neuroscience at Duke University in North Carolina, and one of the top canine cognition experts in the world. Thoroughly researched and written in the likable voice of a brainy scientist sitting at your kitchen table. With the help of some wolves, Russian foxes, New Guinea singing dogs and a Labrador Retriever named Oreo, Brian Hare tells us about his fascinating search for an understanding of how dogs think and communicate.